Rhône reds are my jam. The first wine both Greg and I can remember really speaking to us as a wine of terroir, the first time we could really taste what that meant, was a Châteauneuf-du-Pape his brother Dave poured for us. Since then I’ve grown to love many other wines and wine regions, but if I had to choose, my favorite region for reds is still the Rhône. I love the combination of power and rusticity in the wines. They’re often inviting, generous, easy crowd pleasers, but are at the same time very complex at the high end. On the flip side, even a simple Côtes du Rhône will offer plenty of easy pleasure. In addition to all this, the best versions have an elegance that counterbalances that rustic bent. The Southern Rhône is the home of the GSM (Grenache/Syrah/Mourvèdre) blends I so love in general; and I’m more than happy to let Syrah take center stage in a glass from the Northern Rhône as well. Either way, I’m always happy to open a bottle of something Rhône, but in this case I thought I’d take it a step up from the usual Côtes du Rhône and Côtes du Rhône Villages that often cycle through our everyday wine rotation. (For a few everyday values, click here.) Riding off of my New Year’s Resolution to open more of "the good bottles," which was spurred on by Open That Bottle Night, I recently decided to pull a Gigondas from “the cellar” for Greg and I to enjoy as a little weeknight treat, just because. YOLO and carpe diem. Gigondas is the furthest north of the major Southern Rhône AOP’s, covering the foothills of the Dentelles de Montmirail. The soils are composed predominantly of alluvial stony red clay, and it has a hot, dry Mediterranean climate. It’s been long regarded for the quality of its wines. It was the first of the Côtes du Rhône Villages to be elevated to its own appellation in 1971, however, wine has been cultivated here since ancient times. According to Rhone-wines.com veterans of the 2nd Roman Legion are credited with planting the first vineyards here, and the oldest written reference to vineyards in Gigondas date back to the 12th century. In terms of style (as well as quality), Gigondas is often compared to Châteauneuf-du-Pape with a more muscular tone. The wines have power and are bold and open with plenty of ripeness thanks to that hot climate. (It’s worth noting that minimum alcohol level here is 12.5%, as stipulated by the AOP–this is among the highest in France.) The reds (they also make rosé) tend to have big berry flavors with leather and spice notes. Bringing those big red berry notes is Grenache, the dominant grape here making up 50%-80% of the blend. Syrah and Mourvèdre are up next in varying proportions (15% minimum combined). All the other Rhône grape varieties allowed in Côtes du Rhône—except Carignan—are allowed to make up to 10% of the blend. Despite the generally high quality of the wines here, they still tend to skew a little less expensive than Châteauneuf-du-Pape, so it’s definitely an appellation worth exploring. 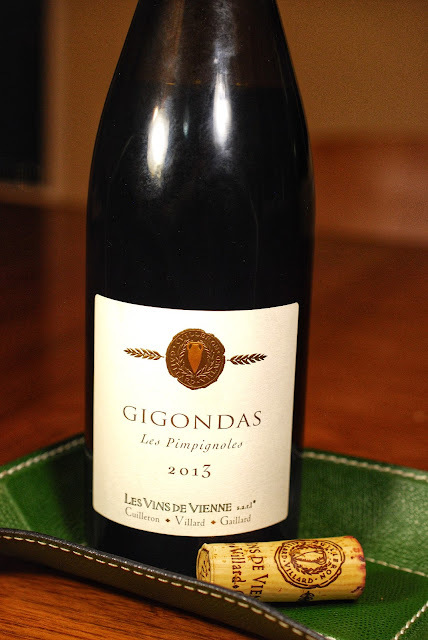 Today’s wine is the Les Vins de Vienne Gigondas Les Pimpignoles 2013. 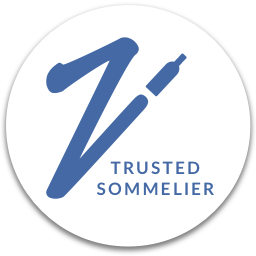 Les Vins de Vienne is a partnership between Yves Cuilleron, Francois Villard, and Pierre Gaillard– three superstars of the Northern Rhône. They initially got together to resurrect one vineyard in the the Northern Rhône and then just kept on going, expanding to many spots throughout the region. 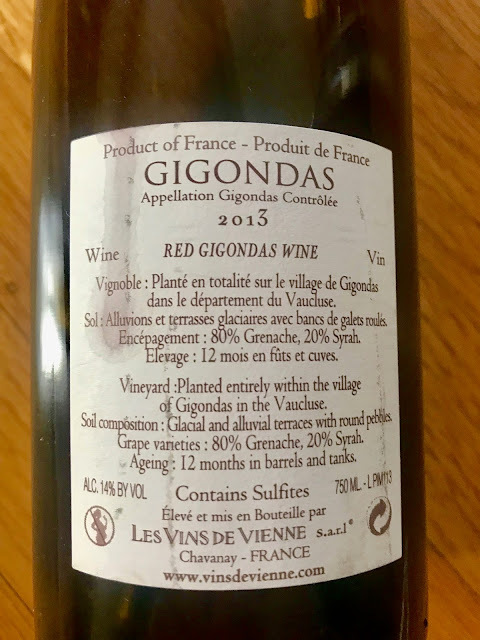 This Gigondas was slightly shy on the nose to start, but gave off notes of warm cherries, raspberries, and red plums, just slightly stewed. There was a brambly, mulchy note, like you might get from walking through a forest after rain. There was a hint of flowers in the background. On the palate, we got warm, dusty, round stones and gravel. We also got notes of thyme, sage brush, and white pepper. There were similar fruit notes to the nose; they were very lightly cooked, like fruit within minutes of being added to a pot. The wine rounded out with time after decanting, and hints of darker fruits like blackberry joined the party, along with a little plum skin and licorice spice. Greg also got a whiff of something that reminded him of rye bread. The wine had medium+ body and alcohol was on the high end at 14%. However, while it was warm, it did not feel heavy, and while the acid was medium, it held up. The tannins did have a bit of grip, but weren’t overpowering. Overall, the wine had a nice ride on the palate, particularly after it opened up. Since this I knew this post was to go up around or on St. Patrick’s Day (Happy St. Patty's Day!) 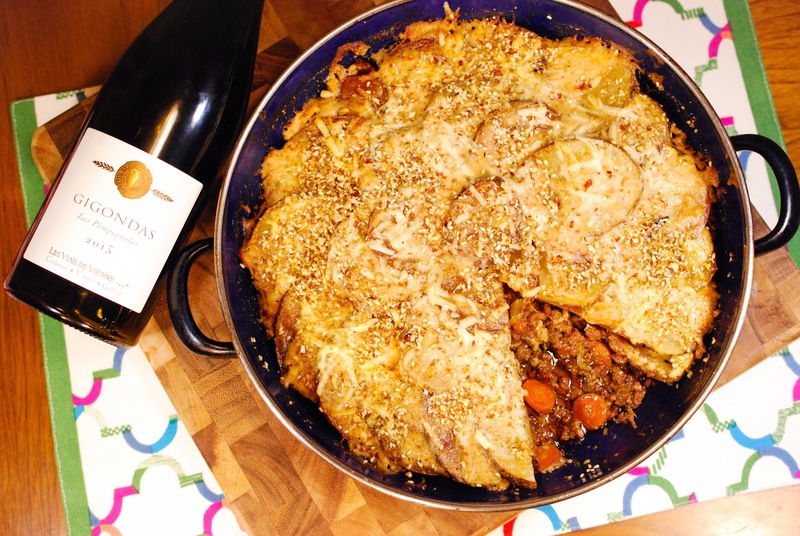 in order to join the French Winophiles group this month (scroll down to see more), I thought it would be really fun to make a twist on a shepherd’s pie. Even though the wine is French and dish is Irish, I could see them happily marrying together. The Rhône is almost always a great match for lamb and stewed meat dishes. I wanted to use a combo of ground lamb and beef. The store, however, was out of lamb, so I went with all beef but used a combo of beef and lamb stocks to add a hint of gamey flavor. Use whatever combination you like or have available. I used an 80% lean blend for the meat, but this did give off a little more fat than I would have liked–I think I’d go with 85% next time. I also decide to use leeks in place of onions in my mirepoix to give it a gently herbal flavor. I then added thyme and sage to match the herb notes we picked up. For a twist, I decided to make a top of potatoes gratin in place of the typical mashed potatoes. The gratin felt a little more French somehow; besides, creamy bechamel always feels decadent. We happened to have a chunk of a lightly aged, washed rind sheep’s milk cheese leftover in the fridge, just looking for a purpose, so that went into the sauce. It had just a mild hint of funk and piquancy, and I thought the wine would be able to handle it well. In its place, you could use any cheese that melts decently well that has a mild bite–Swiss, Parmesan, Asiago or a lightly aged Gouda should all work well. To gild the lily just a little bit, Greg suggested trying to find something with that “rye” factor to top the whole thing off. I thought about using rye bread crumbs or caraway seeds, but instead I found dukkah at Trader Joe’s (which is a blend of nuts, seeds, herbs, and spices) and it became an easy way to add a little extra touch of texture and flavor in one easy move. However, it is totally optional. I think this combo will make for a very Happy St. Patrick’s Day–Cheers! The winemaker made this part easy today–they put a lot of detailed info right on the back label. I love that! 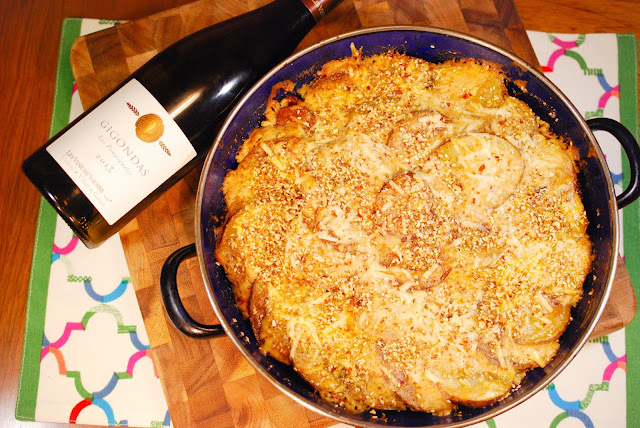 The producer’s website recommend duck pie with morel mushrooms for this wine, and I do think that would be fantastic, as would most game meats. A while back I wrote this 8 & $20 recipe for Braised Lamb Shanks and Lentil Stew for WineSpectator.com, and I’m sure this wine would also go really well. If you’re looking for other wines to pair, look for reds of medium to medium+ body with hints of herbs and earthiness. Earlier this year, the French Winophiles explored the wines of Corbières and Minervois, and I think those wines would work well here as well and vice versa. As always if you try a combo you love, please share in the comments! Makes 6 to 8 servings. Total timing on this was about 1 hour 45 minutes to 2 hours, from prep to finish. However, I was kind of taking my time–I think timing on this could easily go down considerably if you’re moving quickly. 2. Arrange potato slices on a greased baking sheet. Sprinkle with salt and pepper and drizzle with a little olive oil. Roast the potatoes for 10 to 12 minutes, then flip and continue to cook for another 10 to 12 minutes or until cooked through and starting to lightly brown. 3. Start the meat filling while the potatoes are cooking. In an oven-safe braising pan, skillet, or Dutch oven (I used a 3-quart pan.) Add a generous drizzle of olive oil to the pan, then add in the sliced leeks, carrots, and celery to the pan. Season with a little salt and pepper and cook over medium to medium-high until the leeks and celery are tender and cooked through and the carrots are tender-crisp. Add in the garlic, stir in the tomato paste, and sprinkle in 2 Tbsps of flour and allow to cook for another minute or two until the tomato paste is starting to deepen in color. Deglaze with a little bit of stock (alternatively you could use a little wine or water) and add in the thyme, sage, and season again with salt and pepper. Once the liquid has cooked off, add in the meat and cook until no longer pink, making sure to break it up as it cooks. Gradually add in the stock and toss with meat mixture to combine. Cook until the liquid had thickened a bit to a light, gravy-like consistency. Taste and adjust seasoning. 4. As the vegetables for the meat mixture is cooking, make a bechamel. Heat the butter over medium-low heat until melted. Add the remaining tablespoon of flour and stir until it forms a smooth paste. Over medium-high heat cook until the paste turns light brown in color, about 8 to 10 minutes. (I opted for a slightly darker roux than normal to add an extra nutty flavor.) Warm up the milk (I just warmed it up for a minute or so in the microwave). Gradually add the milk to the flour mixture, whisking continuously until it’s very smooth. Bring the sauce to a boil then reduce heat to a simmer. Cook for about 10 minutes, stirring often. Once the sauce is beginning to thicken, whisk in about ½ the cheese mixture, stirring until smooth. Season with salt and pepper to taste, then keep warm until ready to use. 5. Put all the components together. 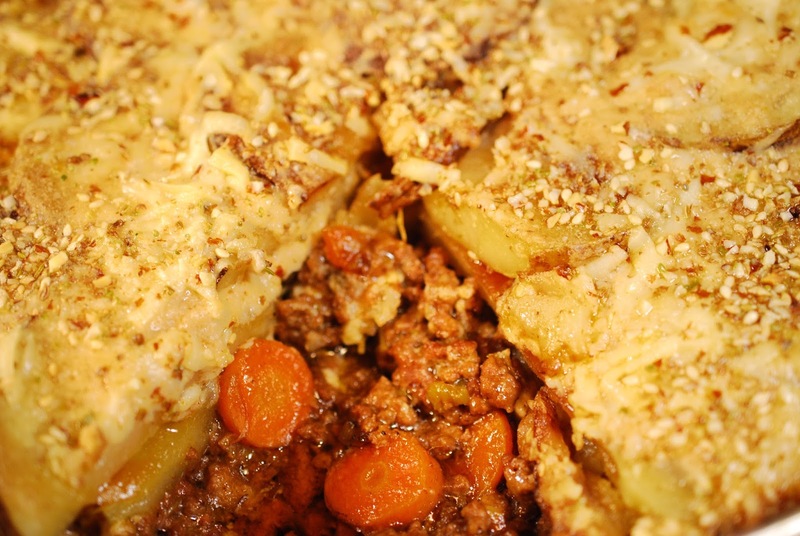 Arrange the potato slices in a layer on top of the meat mixture. Pour the bechamel over the potatoes and gently spread until it’s evenly distributed. Sprinkle the remaining cheese on top. Bake in the oven for about 15 minutes. Sprinkle the dukkah on top (if using) then cook for another 5 minutes. If you’d like it to be more browned on top at that point, put the Shepherd’s pie under the broiler for a minute or two. Remove from the oven and serve. If you’re looking for something to pair with a white Rhône wine, check out my 8 & 20 for Ham Steaks with Peach-Tomato Succotash. Check out these other posts from The French #Winophiles on the wines of the Rhône Valley and join us Saturday morning, March 17 at 10 a.m. CST on Twitter. Just use #Winophiles – it’s really fun! Earlier this month my tasting group also explored the Rhône and we had many hits. See my Instagram pic on Nibbling Gypsy with that line-up for inspiration. There’s always so much more to explore! First, that shepherd's pie looks amazing! And it's basically hachis parmentier, so that counts as French in my book. Second, it's been years since I've had a Gigondas. You've inspired me! I'm going to pick one up at my next opportunity. So happy to provide inspiration to drink something delicious-Cheers! 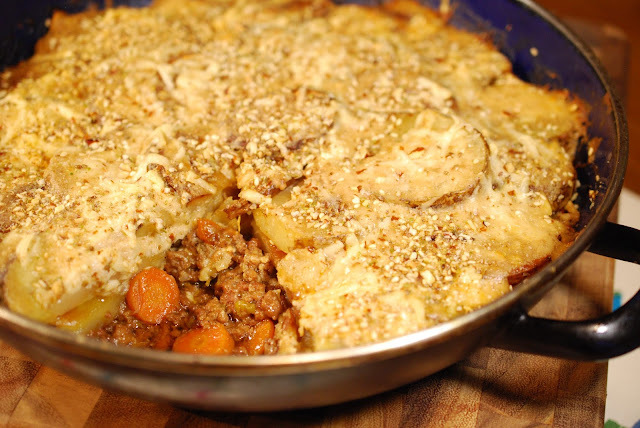 Nicole, I love your twist on shepherd's pie! I'm with you on Gigondas being a more affordable choice while still being a major step up up from CdR. Shepherd's pie is on the menu tonight. If he's not set on another recipe, I might suggest this version. Thanks and cheers! Thanks Cam–let me know how it turns out if you guys do make it! Your shepherd's pie sounds wonderful and I'm sure it was a better pairing than my corned beef nod to St. Pat's Day. Thanks for sharing and for showcasing a wine different than those we received. Your soup sounded delicious though! And thanks so much, it really was delicious! As Rob and Jeff said, the pie! Always enjoy your articles Nicole, great info. Like you, love Rhone wines and after visiting Gigondas, I seem to reach for it but would like to explore the northern Rhone more. I had a Côte-Rotie blend from Côte Brune and Côte Blonde vineyards and planned to participate but the evening didn't work. An excuse to try more- cheers! Thanks Lynn. And I know that Côte-Rotie is going to be beautiful! This looks seriously amazing! I am going to save this recipe. Thanks for sharing. Thanks Michelle! Let me know how it turns out if you make it. A great post Nicole. I love the detail about Gigondas (a favorite of mine) and your love of GSMs and Rhone wines! 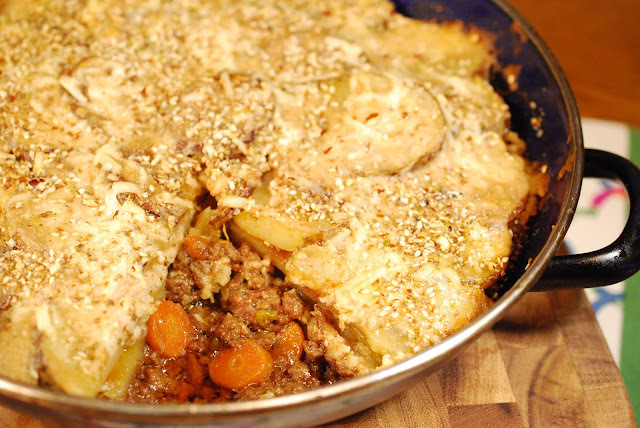 Your Shepherds pie looks fantastic too! Love how you Frenchified the Shepherd's Pie. The gratin looks absolutely scrumptious! With another nor'easter headed our way tomorrow, I might just make this a project for the day. Cheers! Stay warm! And do let me know how it turns out if you make it. Double high five for Gigondas - which is at the tippy top of my list of faves. I love the area and the wines are superb. The pie is gorgeous - it has something special. We’ve never made a Shepherd’s Pie but they remind me of cozy pubs in Ireland. I love this pairing - beautiful, Nicole! Thanks so much Jill! Really appreciate it. Okay, your Shepherd's Pie with the potato gratin on top is a great idea! As always I love how you work through your ingredient selection process for a recipe in order to better pair it with your food! I love Gigondas. One of my favorites in southern Rhone. I have fond memories of visiting there a couple of years ago. That shepards pie looks amazing. Thanks Rupal. I've actually never been to the Rhône, but would sooooooo love to go. I can imagine that it's gorgeous. I agree that French wine and Irish food can be a good combo! Looks like a great pairing here! Thanks! It really was a very delicious pair. The shepherds pie would be hachis parmentier in Lyon, so your meal is as Rhone French as can be! Looks terrific!